In a medium saucepan, bring 2 cups water to a boil over high heat. Remove from heat, and add gelatin, whisking to dissolve. Pour into 6 (12 ounce) glasses. 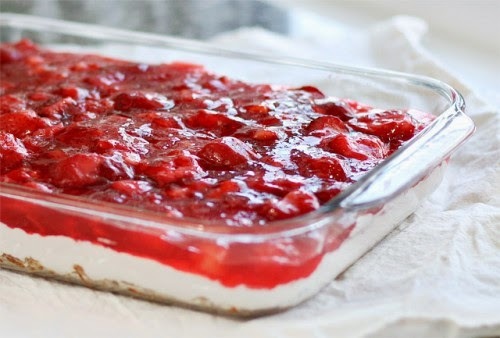 Add sliced strawberries to gelatin. Refrigerate for 2 hours or until gelatin begins to set. In a large bowl, beat neufchatel cheese and sugar at medium speed with a mixer until smooth. Fold in whipped topping. Spoon evenly over gelatin layer in glasses. Cover and refrigerate for at least 2 hours or overnight. Top with crushed pretzels before serving.